As wildfires raged this month in California, insurance claims experts at Travelers sat in a command center 3,000 miles (4,828 kilometers) away in Connecticut, monitoring screens showing satellite images, photos from airplane flyovers and social media posts describing what was happening on the ground. Real-time data and technology that were unavailable to property-casualty companies even a few years ago have shaped the industry's response to the Camp Fire, which has burned nearly 240 square miles (622 square kilometers) in northern California and the 151-square-mile (391-square-kilometer) Woolsey Fire in the Los Angeles area. By overlaying the data on maps marking its customers' locations, the company can quickly identify those who are likely to have been affected, said Jim Wucherpfennig (WUH'-kur-fih-nee), Travelers vice president of claims. "That allows us to deploy people and resources where they are needed most," he said. The same data also can be used to determine risk and pricing for insurance in any given area, said Peter Kochenburger, the deputy director of the University of Connecticut's insurance law center. Insurers, for example, can use the telemetry to identify local vegetation, wind patterns and fire history. In some cases, it can determine that the owner of one home is more likely to suffer damage than the owner of a neighboring home, he said. "Does it seem intrusive? It can be," he said. "They have a lot more information on all of us, on our properties than they had two, five, 10 years ago. That's a major issue and that's something regulators are going to have to talk about." During the wildfires, Travelers said the information has been used to expedite claims, even in areas that are still inaccessible to inspectors. Workers were able to see what roads were open and map out spots in Chico and Thousand Oaks to park the RVs that serve as mobile claim centers, the company said. The tools also indicated where customers who evacuated were going to be, Wucherpfennig said. The glassed-in Travelers National Catastrophe Center is located in Windsor, Connecticut. 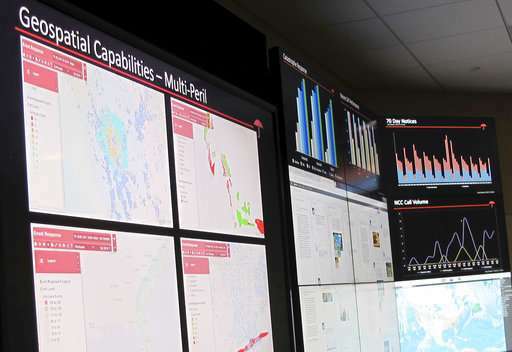 Modeled after military war rooms, it includes a conference table behind 19 high-definition screens, which display maps, graphs, television images and social media sites, all providing real-time data on the fires. In some cases, even before adjusters arrive on scene, claims experts can assess damage from the fires and cut checks by using before-and-after images taken by drones, aircraft or satellites as well as videos or photos uploaded by customers from their phones. Employees have tools and smart phone apps that can convert those photos into instant measurements, to help quantify the damage. "We're able to virtually interact with customers much more easily than we could even in the recent past," Wucherpfennig said. 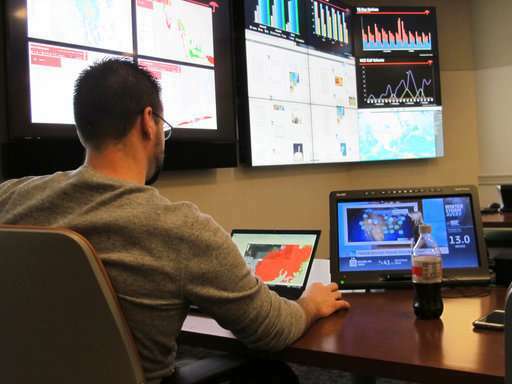 "We're also able to monitor all forms of social media in real time. That helps us create an event footprint, which helps us understand how the event is tracking and what type of damages we're seeing."